I took this photo on my living room in the morning about 9 am. Don’t know why I was so drawn to the sunflowers at Trader Joe’s – maybe it was the price (cheap -$4.99) that gave the most drama for the buck. Or maybe I just needed the yellow power. 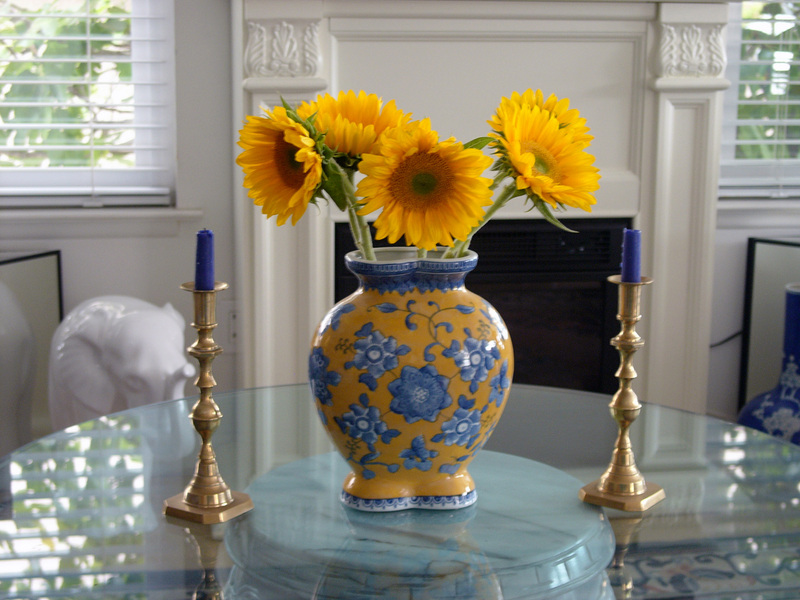 The Chinese vase I bought at Marshalls for nothing, probably $10-20 – I can’t remember now; it was years ago. The brass candlesticks I bought in a second hand store in Copenhagen for about $20. Avila Beach CA has a trendy little Farmer’s Market on Friday afternoons with a handful of produce booths selling only top quality. A real find for me was purple basil which is incredibly rare. I wish I had adequate words to describe the rich, heady aroma with almost a hint of licorice or anise. Sensing the potency of the taste would match the scent, I chopped it fine on a caprese salad instead of using whole leaves as I would with standard “green” basil. 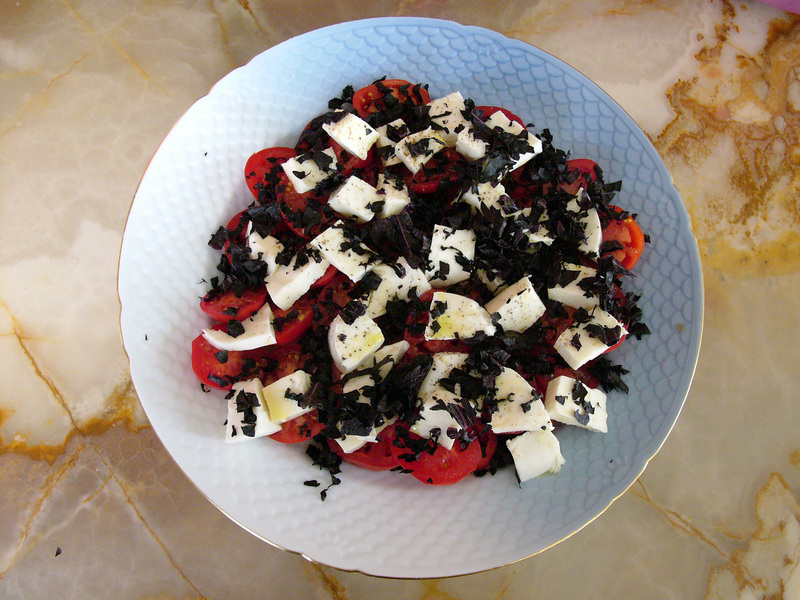 The tomatoes came from a local farmer and the mozzarella cheese from DePalo and Sons Deli in Shell Beach CA. The cheese is hand-crafted daily from grandfather Dr. Tedone’s recipe. The good doctor, retired now, starting making the cheese to work out his grief after his wife passed. DePalo’s is a family affair with an excellent Italian-California style deli, tremendous wine collection and shelves stuffed with every imaginable delicacy.